Egham, UK – 26 January 2016: Freecom launches the Tablet Mini SSD (solid-state drive) for users eager to take full advantage of a pocket-sized storage device. It is compatible with notebooks, PCs, Macs, and tablets and smartphones that possess a USB Micro B connector offering OTG support using Android or Windows. The Freecom Tablet Mini SSD offers versatile connectivity, fast speeds and high reliability in backing up and transferring data. Freecom’s Tablet Mini SSD is the first device of its kind to have two inbuilt cables for extra convenience to users when connecting to different devices. The integrated USB and micro USB connectors avoid the need to carry separate connection cables. The stylish device offers USB 3.0 data read speeds of up to 430MB/s (Windows and MAC), making it at least four times faster than standard hard disk drives. The unit also brings the other benefits of SSD technology compared to hard disk drives (HDDs); with no moving parts it is silent during operation, it also uses less power and is far more durable. It has shock resistance up to 4m. Available in either 128GB or 256GB data capacity, the compact and lightweight device measures just 9.2cm x 1.5cm x 5.8cm (L x W x H) and weighs just 58g. “Tablets and smartphones have limited internal storage and users have been looking for a device that allows quick and easy back up or transfer of data to other devices including PCs. 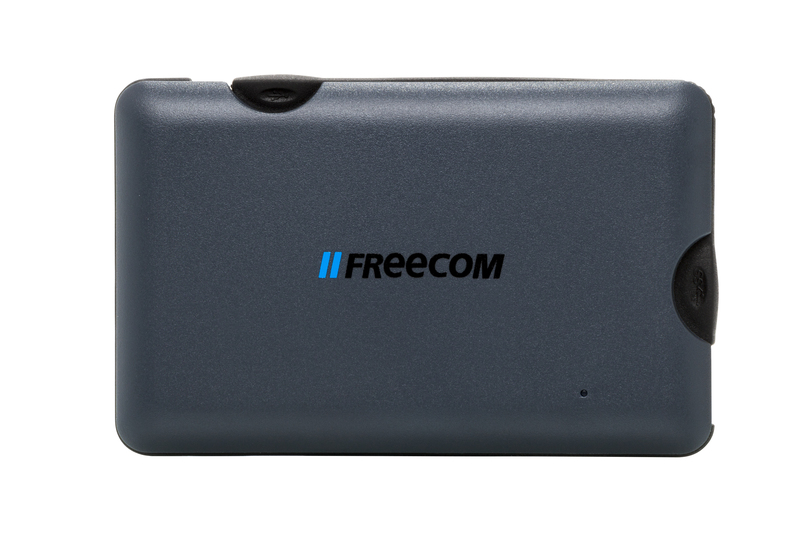 With its integrated dual cable design and high speed SSD performance, the Freecom Tablet Mini SSD is a very practical and reliable and storage tool for people on the go,” explains Martijn Hansbergen, Business Development Manager for Freecom in EMEA. The Freecom Tablet Mini SSD is compatible with many Android and Windows tablets and phones such as the Samsung Galaxy Tab A, HTC Nexus 9, and Sony Xperia Z4 to name just a few. The requirements for compatibility are a USB Micro B plug and OTG support on the device. A full list of compatible devices can be found on Freecom’s website. 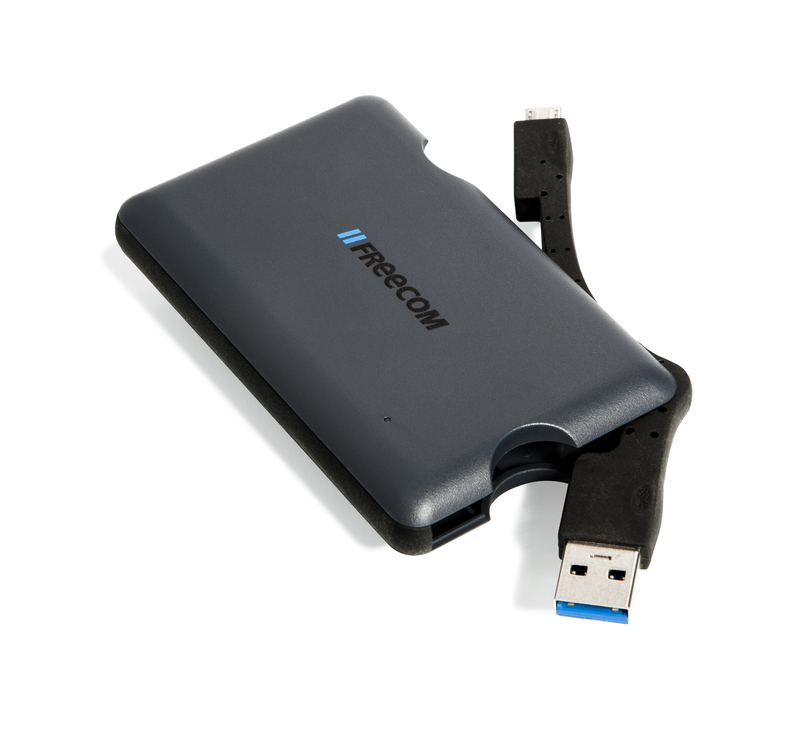 Freecom’s Tablet Mini SSD 128GB model (product reference: 56346) is available now and has an RRP of £89.00. The 256GB model (product reference: 56347) will be launched later in Q1. They come with a two-year manufacturer’s warranty. 1. The Tablet Mini SSD provides USB Recording, enabling users to record televised content to an external storage device directly connected to a TV via USB and pause live TV (only available in certain countries). 2. It comes pre-installed with Nero backup software for full system backup and restore functionality – schedule automatic backups by date and time, or encrypted backup with password protection. For Windows devices only. 3. Transfer speeds are tested using PC operating Windows 8 platform with CrystalDiskMark’s benchmark tool. The actual speed depends on the file size, computer performance and OS. Freecom is a subsidiary of Mitsubishi Kagaku Media. Founded in 1989, Freecom designs, manufacturers and markets innovative desktop and mobile HDD storage solutions, external SSDs, Blu-Ray / DVD burners, and various accessories and services. Freecom serves both PC and Mac users. Established in Germany, Freecom has offices in the Netherlands, France, Germany, Italy, United Kingdom, Denmark, Russia and Johannesburg. For more information, visit Freecom’s website at www.freecom.com and select the country of your location.